Lewis's quality of life has changed tremendously and he can now walk. Now Lily is on a mission to help even more children at Tree of Hope children’s charity! Lily saw a way to help when she was inspired after watching the movie ‘About A Boy’ in which Hugh Grant’s character is able to live off the proceeds of his father’s one-hit Christmas song. Her Christmas song ‘Happy Birthday JC’ was re-released on 1st December to raise funds for Tree of Hope to support more children and help them access life changing treatment and surgery. 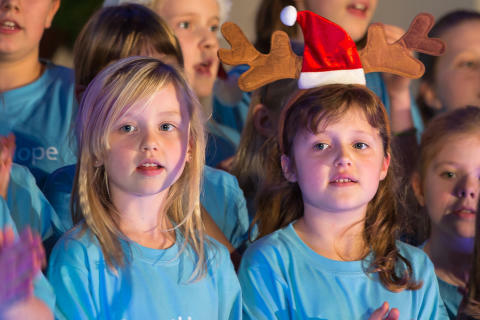 ‘Happy Birthday JC’ is a catchy Christmas tune sung by children of the Aspire Arts Academy, which Lily attends. 80’s icons Tony Hadley and Paul Young also gave their support by adding vocals to the track. It is set to be a memorable Christmas song for years to come, as one reviewer says, “This little tune is not only catchy, the story behind it tugs the heart strings. ... It’s a good cause, get behind it for Christmas, who knows it could be a hit”. “We are happy to have helped Lewis and his family access the SDR treatment that has made such a difference to his life. We are all inspired by Lily’s commitment and determination to help her little brother and we are grateful to all the people who helped put her Christmas song together and of course to the people who have purchased it. We hope that many more people will download the song this year and raise much needed funds to help other sick children” Jeremy Marris CEO at Tree of Hope. “This is such a fun song for children to sing at Christmas time, they can easily learn the words and sing their little hearts out! In most conventional Christmas songs children sing backing vocals, supporting famous recording artists, but this time it’s a role reversal as Tony Hadley and Paul Young wanted to support this great song by adding their vocals to the children's lead vocals” Kat Stephens of Aspire Arts Academy.